This is one of Vorarlbergs best architectural building – planned by Peter Zumthor, who won the Pritzker Prize for this building and the Therme Vals (click here for more about that), this is a must see for all architecture fans. As a plus you might find some architectural exhibitions inside the building, as it houses the Museum for Modern Art of Vorarlberg. Do not forget to take a coffee afterwards in the Museum café as this is a good example for good interior architecture. A short walk from the Kunsthaus Bregenz next to Lake Konstanz takes you to the Festspielhaus Bregenz. 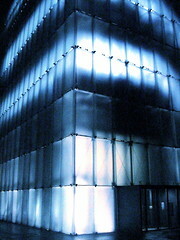 This building was planned by Dietrich-Untertrifaller, a architectural company from Vorarlberg. This building might look familiar to you, there were parts of “James Bond – Quantum of Solace” shot in this building. Every summer there are the Bregenzer Festspiele – an opera festival, with one opera being staged on the lake arena. Its one opera for two years, and every two years the whole stage is completely rebuild – do not miss out on this. In Fussach, a small village at the Lake Konstanz you can see this two great buildings by Baumschlager-Eberle. One, looking a little bit like a gun, is an office building, the other one, with its crystalline structur is a place for events and exhibitions – they both are parts of the “Hafen Rohner” (Port Rohner). This museum offers something different, to the other buildings. Dietrich Untertrifaller, the architects of this building, had the task to take a 500 year old house and adapt it to a modern museum. Here you can see a mixture of old traditional architecture with modern Vorarlberger wood-architecture. The museum itself is great to see as well – Angelika Kauffmann was one of Austrias most famous neoclassical painters. At this stop you will not only see great architecture, you can also have great food and an impressive landscape. Looking like a typical ski hut, this building offers a lot for people, who love the “hidden details” of houses. You can find details to all mentioned buildings by clicking on their name. Unfortunately they are in german – but I believe the pictures give you a good idea about the buildings.